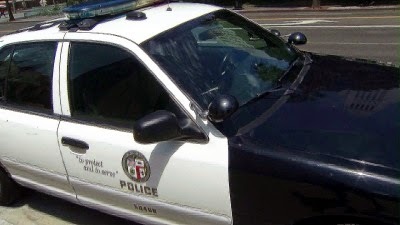 A Los Angeles police officer is under investigation for allegedly beating and kicking a suspect who was being held down by other officers, according to sources close to the probe. The altercation was captured by a private company's security camera. Several police officials who saw the video told the Los Angeles Times that the officer delivered a powerful kick to the suspect's head. One said the officer resembled "a football player kicking a field goal." Another described it as "horrific." The suspect, they said, had surrendered and was not resisting the officers. A lawyer for the officer confirmed that the suspect was kicked but said the blow landed on the man's shoulder. He said the officers used appropriate force on the suspect while trying to handcuff him. After inquiries from The Times, Chief Charlie Beck released a statement Friday saying he was "extremely concerned about this particular use of force." "This investigation is ongoing, and there is still much that needs to be done to determine the facts of this matter, but let me be very clear, any officer that is found to abuse the public is not welcome in this department, and we will apply whatever legal or administrative means necessary to insure the community's trust without exception," Beck said. The four officers involved in the arrest and a sergeant who arrived on scene afterward have been relieved of duty with pay as the department investigates the Oct. 16 incident. The suspect, Clinton Alford, 22, sustained a gash on his ear and was taken to a hospital for stitches and a head scan. He was booked on suspicion of drug possession and resisting arrest and later released on his own recognizance. He has pleaded not guilty. In an interview at his South Los Angeles home, Alford denied the drug charge and said he feared for his life during the encounter. "I was just praying that they wouldn't kill me. I just closed my eyes and tried to hold on," he said. Alford said he was riding his bicycle on the sidewalk along Avalon Boulevard near 55th Street when a car pulled up behind him. A man shouted a command to stop, but Alford said he continued pedaling because the man did not identify himself as a police officer. When someone grabbed the back of the bike, Alford said he jumped off and ran. After a short foot pursuit, two officers caught up to Alford. Footage from the security camera on a nearby building captured Alford voluntarily laying down on the street and putting his hands behind his back, according to several people who viewed the recording. The officers restrained Alford, who made no movements and did not resist, the sources said. Seconds later, a patrol car pulled up and a uniformed officer, who the sources described as "heavyset" or "very large," rushed from the driver's side, according to sources. The officer moved quickly over to Alford, who was still held on the ground by the other officers, and immediately stomped or kicked, the sources said. The officer then dropped to the ground and delivered a series of strikes with his elbows to the back of Alford's head and upper body, sources said. Alford's head can be seen on the video hitting the pavement from the force of the strikes, two sources recounted. Afterward, the officer leaned his knee into the small of Alford's back and, for a prolonged period, rocked or bounced with his body weight on Alford's back, the sources said. At one point, the officer put his other knee on Alford's neck, a source said. Throughout much of the altercation, two officers restrained Alford but eventually they moved away. Two officials who viewed the video said it was clear to them Alford was handcuffed as soon as he got on the ground. Others said it is difficult to tell from the video when Alford was placed in handcuffs. Alford said he had already been handcuffed when he was first kicked. When it was over, Alford's body was limp and motionless, according to sources who viewed the video. It took several officers to carry him to a patrol car, they said. "He looked like a rag doll," one person said of Alford. Gary Fullerton, an attorney representing the officers, declined to discuss details of the incident but disputed that Alford had his hands behind his back when the officers used force. "It is my belief once everything is explained and all the nuances of the incident are understood, it will be clear the force the officers used was appropriate and necessary," he said. Fullerton said the officers were responding to a detective's radio call for help in locating a robbery suspect when they spotted Alford and attempted to apprehend him. Alford turned out not to be the man the detective was pursuing. An arrest record given to Alford by police listed the names and serial numbers of four officers involved in the arrest. The document, reviewed by The Times, identified the "arresting officer" as Julio Cortez, who joined the LAPD in 2000 according to department records. The "second arresting officer" was Richard Garcia, who records show has been on the force for 10 years. Other officers involved were Joshua Tornek and Ruben Rosas, according to the arrest record. Several sources identified Garcia as the officer who struck Alford. None of officers responded to emails seeking comment. The sources who reviewed the video of the incident also raised concerns about the officers' actions following the arrest. Several minutes after Alford is put in the patrol car, they appear to notice the security camera on the building wall. The officer who kicked Alford knocked on the door of the building, which houses a small garment factory, until someone opened the door and he disappeared inside.